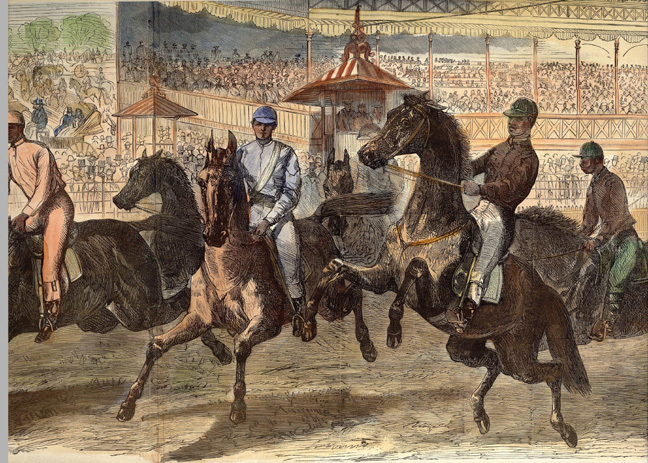 The Bronx County Historical Society - Abe Hawkins at Jerome Park Racetrack, 1866. Home/African American History Project, People, Sports/Abe Hawkins at Jerome Park Racetrack, 1866. The first race at the famous Jerome Park, Fordham track was held on September 25, 1866 and was won by African American jockey Abe Hawkins in front of 20,000 fans, including United States General Ulyses S. Grant. The site is now under the Jerome Park Reservoir. Harper’s Weekly print, “Opening Race at Jerome Park, Fordham, New York,” 1868. The Bronx County Historical Society Collections. Please visit our Rights & Reproductions page for more information.